"Gearbox" redirects here. For the video game developer, see Gearbox Software. For the transmission component, see gear train. Often, a transmission has multiple gear ratios (or simply "gears") with the ability to switch between them as speed varies. This switching may be done manually (by the operator) or automatically. Directional (forward and reverse) control may also be provided. Single-ratio transmissions also exist, which simply change the speed and torque (and sometimes direction) of motor output. Many typical automobile transmissions include the ability to select one of several gear ratios. In this case, most of the gear ratios (often simply called "gears") are used to slow down the output speed of the engine and increase torque. However, the highest gears may be "overdrive" types that increase the output speed. 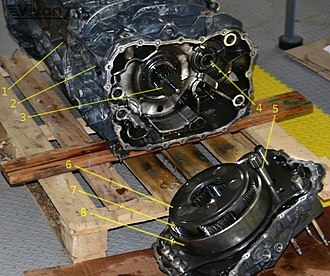 The need for a transmission in an automobile is a consequence of the characteristics of the internal combustion engine. Engines typically operate over a range of 600 to about 7000 rpm (though this varies, and is typically less for diesel engines), while the car's wheels rotate between 0 rpm and around 1800 rpm. Furthermore, the engine provides its highest torque and power outputs unevenly across the rev range resulting in a torque band and a power band. Often the greatest torque is required when the vehicle is moving from rest or traveling slowly, while maximum power is needed at high speed. Therefore, a system is required that transforms the engine's output so that it can supply high torque at low speeds, but also operate at highway speeds with the motor still operating within its limits. Transmissions perform this transformation. 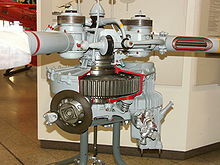 The now ubiquitous constant-mesh gearboxes, which can include non-synchronised, or synchronized/synchromesh systems, where typically diagonal cut helical (or sometimes either straight-cut, or double-helical) gear sets are constantly "meshed" together, and a dog clutch is used for changing gears. 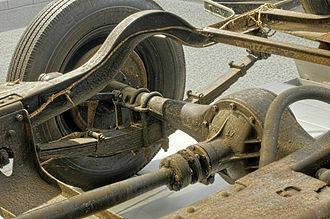 On synchromesh boxes, friction cones or "synchro-rings" are used in addition to the dog clutch to closely match the rotational speeds of the two sides of the (declutched) transmission before making a full mechanical engagement. Manual transmissions are the most common type outside North America and Australia. They are cheaper, lighter, usually give better performance, but the newest automatic transmissions and CVTs give better fuel economy. It is customary for new drivers to learn, and be tested, on a car with a manual gear change. In Malaysia and Denmark all cars used for testing (and because of that, virtually all those used for instruction as well) have a manual transmission. 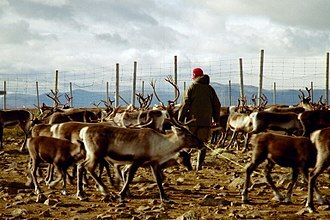 In Japan, the Philippines, Germany, Poland, Italy, Israel, the Netherlands, Belgium, New Zealand, Austria, Bulgaria, the UK, Ireland, Sweden, Norway, Estonia, France, Spain, Switzerland, the Australian states of Victoria, Western Australia and Queensland, Finland, Latvia, Lithuania and the Czech Republic, a test pass using an automatic car does not entitle the driver to use a manual car on the public road; a test with a manual car is required. Manual transmissions are much more common than automatic transmissions in Asia, Africa, South America and Europe. Manual transmissions can include both synchronized and unsynchronized gearing. For example, reverse gear is usually unsynchronised, as the driver is only expected to engage it when the vehicle is at a standstill. Many older (up to 1970s) cars also lacked synchronisation on first gear (for various reasons—cost, typically "shorter" overall gearing, engines typically having more low-end torque, the extreme wear on a frequently used first gear synchroniser ...), meaning it also could only be used for moving away from a stop unless the driver became adept at double-declutching and had a particular need to regularly downshift into the lowest gear. Some manual transmissions have an extremely low ratio for first gear, called a creeper gear or granny gear. Such gears are usually not synchronized. This feature is common on pick-up trucks tailored to trailer-towing, farming, or construction-site work. During normal on-road use, the truck is usually driven without using the creeper gear at all, and second gear is used from a standing start. 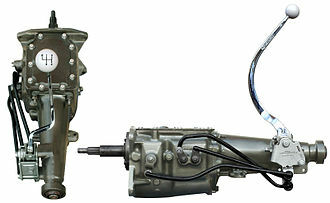 Some off-road vehicles, most particularly the Willys Jeep and its descendants, also had transmissions with "granny first's" either as standard or an option, but this function is now more often provided for by a low-range transfer gearbox attached to a normal fully synchronized transmission. Some commercial applications use non-synchronized manual transmissions that require a skilled operator. Depending on the country, many local, regional, and national laws govern operation of these types of vehicles (see Commercial Driver's License). This class may include commercial, military, agricultural, or engineering vehicles. Some of these may use combinations of types for multi-purpose functions. An example is a power take-off (PTO) gear. The non-synchronous transmission type requires an understanding of gear range, torque, engine power, and multi-functional clutch and shifter functions. Also see Double-clutching, and Clutch-brake sections of the main article. Float shifting is the process of shifting gears without using the clutch. Automatic transmissions are easy to use. 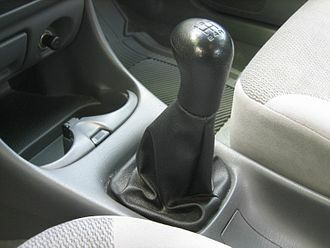 However, in the past, some automatic transmissions of this type have had a number of problems; they were complex and expensive, sometimes had reliability problems (which sometimes caused more expenses in repair), have often been less fuel-efficient than their manual counterparts (due to "slippage" in the torque converter), and their shift time was slower than a manual making them uncompetitive for racing. With the advancement of modern automatic transmissions this has changed. For certain applications, the slippage inherent in automatic transmissions can be advantageous. For instance, in drag racing, the automatic transmission allows the car to stop with the engine at a high rpm (the "stall speed") to allow for a very quick launch when the brakes are released. In fact, a common modification is to increase the stall speed of the transmission. This is even more advantageous for turbocharged engines, where the turbocharger must be kept spinning at high rpm by a large flow of exhaust to maintain the boost pressure and eliminate the turbo lag that occurs when the throttle suddenly opens on an idling engine. A hybrid form of transmission where an integrated control system handles manipulation of the clutch automatically, but the driver can still—and may be required to—take manual control of gear selection. This is sometimes called a "clutchless manual", or "automated manual" transmission. Many of these transmissions allow the driver to fully delegate gear shifting choice to the control system, which then effectively acts as if it was a regular automatic transmission. They are generally designed using manual transmission "internals", and when used in passenger cars, have synchromesh operated helical constant mesh gear sets. Most modern implementations, however, are standard or slightly modified manual transmissions (and very occasionally modified automatics—even including a few cases of CVTs with "fake" fixed gear ratios), with servo-controlled clutching and shifting under command of the central engine computer. These are intended as a combined replacement option both for more expensive and less efficient "normal" automatic systems, and for drivers who prefer manual shift but are no longer able to operate a clutch, and users are encouraged to leave the shift lever in fully automatic "drive" most of the time, only engaging manual-sequential mode for sporty driving or when otherwise strictly necessary. 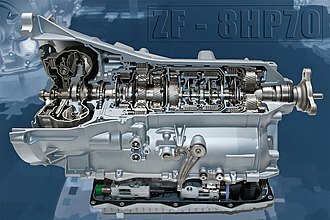 A dual-clutch transmission alternately uses two sets of internals, each with its own clutch, so that a "gearchange" actually only consists of one clutch engaging as the other disengages—providing a supposedly "seamless" shift with no break in (or jarring reuptake of) power transmission. Each clutch's attached shaft carries half of the total input gear complement (with a shared output shaft), including synchronised dog clutch systems that pre-select which of its set of ratios is most likely needed at the next shift, under command of a computerised control system. Specific types of this transmission include: Direct-Shift Gearbox. There are also sequential transmissions that use the rotation of a drum to switch gears, much like those of a typical fully manual motorcycle. These can be designed with a manual or automatic clutch system, and may be found both in automobiles (particularly track and rally racing cars), motorcycles (typically light "step-thru" type city utility bikes, e.g., the Honda Super Cub) and quadbikes (often with a separately engaged reversing gear), the latter two normally using a scooter-style centrifugal clutch. Several attempts have been made to fit bicycles with an enclosed gearbox, giving obvious advantages for better lubrication, dirt-sealing and shifting. These have usually been in conjunction with a shaft drive, as a gearbox with a traditional chain would (like the hub gear) still have many of the derailleur's disadvantages for an exposed chain. Bicycle gearboxes are enclosed in a box replacing the traditional bottom bracket. The requirement for a modified frame has been a serious drawback to their adoption. One of the most recent attempts to provide a gearbox for bicycles is the 18 speed Pinion P1.18. This gives an enclosed gearbox, but still a traditional chain. When fitted to a rear suspension bike, it also retains a derailleur-like jockey cage chain tensioner, although without the derailleur's low ground clearance. This arrangement is also sometimes known as a direct shift gearbox or powershift gearbox. It seeks to combine the advantages of a conventional manual shift with the qualities of a modern automatic transmission by providing different clutches for odd and even speed selector gears. When changing gear, the engine torque is transferred from one gear to the other continuously, so providing gentle, smooth gear changes without either losing power or jerking the vehicle. Gear selection may be manual, automatic (depending on throttle/speed sensors), or a 'sports' version combining both options. CVTs are increasingly found on small cars, and especially high-gas-mileage or hybrid vehicles. On these platforms, the torque is limited because the electric motor can provide torque without changing the speed of the engine. By leaving the engine running at the rate that generates the best gas mileage for the given operating conditions, overall mileage can be improved over a system with a smaller number of fixed gears, where the system may be operating at peak efficiency only for a small range of speeds. CVTs are also found in agricultural equipment; due to the high-torque nature of these vehicles, mechanical gears are integrated to provide tractive force at high speeds. 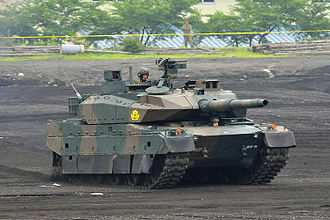 The system is similar to that of a hydrostatic gearbox, and at 'inching speeds' relies entirely on hydrostatic drive. German tractor manufacturer Fendt pioneered the technology, developing its 'Vario ' transmission. The IVT is a specific type of CVT that includes not only an infinite number of gear ratios, but an "infinite" range as well. This is a turn of phrase, it actually refers to CVTs that are able to include a "zero ratio", where the input shaft can turn without any motion of the output shaft while remaining in gear. The gear ratio in that case is not "infinite" but is instead "undefined". The Electric Variable Transmission (EVT) combines a transmission with an electric motor to provide the illusion of a single CVT. 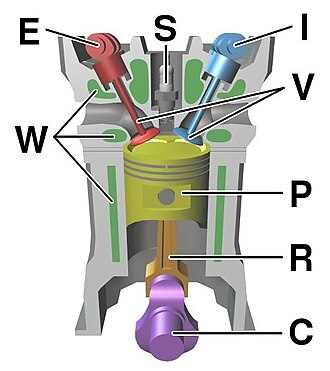 In the common implementation, a gasoline engine is connected to a traditional transmission, which is in turn connected to an epicyclic gear system's planet carrier. An electric motor/generator is connected to the central "sun" gear, which is normally un-driven in typical epicyclic systems. Both sources of power can be fed into the transmission's output at the same time, splitting power between them. In common examples, between one-quarter and half of the engine's power can be fed into the sun gear. Depending on the implementation, the transmission in front of the epicyclic system may be greatly simplified, or eliminated completely. EVTs are capable of continuously modulating output/input speed ratios like mechanical CVTs, but offer the distinct benefit of being able to also apply power from two different sources to one output, as well as potentially reducing overall complexity dramatically. The canonical example of the EVT is Toyota's Hybrid Synergy Drive. This implementation has no conventional transmission, and the sun gear always receives 28% of the torque from the engine. This power can be used to operate any electrical loads in the vehicle, recharging the batteries, powering the entertainment system, or running the air conditioning system. Any residual power is then fed back into a second motor that powers the output of the drivetrain directly. At highway speeds this additional generator/motor pathway is less efficient than simply powering the wheels directly. However, during acceleration, the electrical path is much more efficient than an engine operating so far from its torque point. GM uses a similar system in the Allison Bus hybrid powertrains and the Tahoe and Yukon pick-up trucks, but these use a two-speed transmission in front of the epicyclic system, and the sun gear receives close to half the total power. 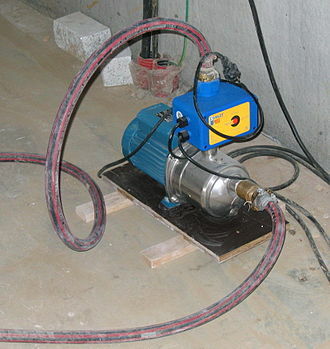 If the hydraulic pump or hydraulic motor make use of the hydrodynamic effects of the fluid flow, i.e. 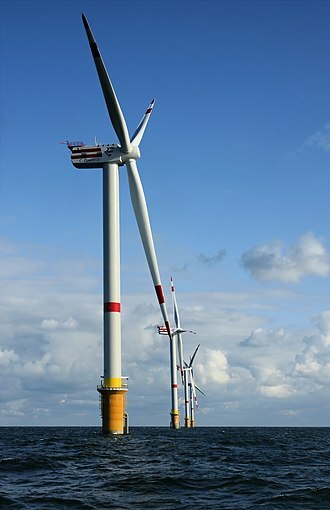 pressure due to a change in the fluid's momentum as it flows through vanes in a turbine. The pump and motor usually consist of rotating vanes without seals and are typically placed in proximity. The transmission ratio can be made to vary by means of additional rotating vanes, an effect similar to varying the pitch of an airplane propeller. 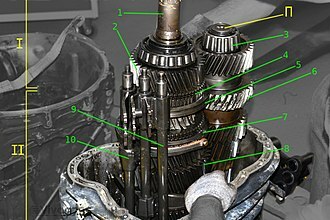 ^ In American English, a gearbox can be any housing containing a gear train, even just one pair of bevel gears; a transmission is a type of gearbox that is used to dynamically change the speed-torque ratio such as in a vehicle; and automatic transmissions are usually called by that name only, although manual transmissions are often called gearboxes. ^ J. J. Uicker; G. R. Pennock; J. E. Shigley (2003). Theory of Machines and Mechanisms (3rd ed.). New York: Oxford University Press. ISBN 9780195155983. ^ B. Paul (1979). Kinematics and Dynamics of Planar Machinery. Prentice Hall. ^ "Experts predict nine-, 10-speed transmissions to dominate in North America". Autoweek. May 13, 2013. ^ "Ford, GM work together on new nine-, 10-speed transmissions". Autoweek. April 15, 2013. ^ "Practical Driving Test FAQs". Dvtani.gov.uk. 2009-10-04. Archived from the original on 2010-11-14. Retrieved 2014-04-29. ^ "Victorian restrictions on probationary drivers". Vicroads.vic.gov.au. 2014-01-14. Archived from the original on 2014-08-01. Retrieved 2014-04-29. ^ "Transportlīdzekļu vadītāja tiesību iegūšanas un atjaunošanas kārtība un vadītāja apliecības izsniegšanas, apmaiņas, atjaunošanas un iznīcināšanas kārtība" (in Latvian). Likumi.lv. Retrieved 2014-04-29. ^ "All Pro Transmissions". All Pro Transmissions. Retrieved 2018-07-10. ^ "2013 Subaru Impreza Wagon AWD". fueleconomy.gov. Retrieved November 29, 2013. ^ Marshall Brain. "How Sequential Gearboxes Work". Howstuffworks.com. Retrieved July 2, 2013. ^ "Rohloff 14-speed hub". Rohloff.de. Retrieved 2014-04-29. ^ Ben Coxworth (13 March 2013). "Pinion sealed gearbox offers an alternative to those darn derailleurs". Gizmag. 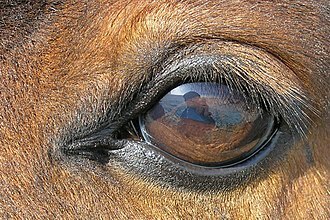 ^ Matt Wragg (6 June 2012). "Pinion P1.18 Gearbox: First Ride". Pinkbike. ^ "The Gearmakers". Pinion. Retrieved 2014-04-29. ^ "The Prius 'Continuously Variable Transmission'". Prius.ecrostech.com. 2001-10-10. Retrieved 2014-04-29. Harald Naunheimer; Peter Fietkau; G Lechner (2011). Automotive transmissions : fundamentals, selection, design and application (2nd ed.). Springer. doi:10.1007/978-3-642-16214-5. ISBN 9783642162138. Wikimedia Commons has media related to Transmissions. Look up transmission in Wiktionary, the free dictionary. A hoist is a device used for lifting or lowering a load by means of a drum or lift-wheel around which rope or chain wraps. It may be operated, electrically or pneumatically driven and may use chain. The load is attached to the hoist by means of a lifting hook, the basic hoist has two important characteristics to define it, Lifting medium and power type. The lifting medium is either wire rope, wrapped around a drum, or load-chain, the power can be provided by different means. 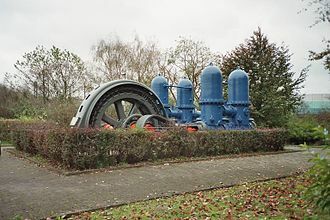 Common means are hydraulics and air driven motors, both the wire rope hoist and chain hoist have been in common use since the 1800s, however mass production of an electric hoist did not start until the early 1900s and was first adapted by Germany. A hoist can be built as one unit, designed for cost-effective purchasing and moderate use, or it can be built as a built-up custom unit, designed for durability. The built-up hoist will be more expensive, but will be easier to repair. Package units were regarded as being designed for light to moderate usage. Built-up units are designed for heavy to severe service, but over the years that market has decreased in size since the advent of the more durable packaged hoist. A machine shop or fabricating shop will use an integral-package hoist, while a Steel Mill or NASA would use a unit to meet durability, performance. NASA has seen a change in the use of package hoists, the NASA Astronaut training pool, for example, utilizes cranes with packaged hoists. The more commonly used hoist in todays worldwide market is an electrically powered hoist and these are either the chain type or the wire rope type. See the Hoists Manufacturers Institute site for true life calculation which is based on load, in todays modern world for the North American market there are a few governing bodies for the industry. The Overhead Alliance is a group that represents Crane Manufacturers Association of America, Hoist Manufacturers Institute and these product counsels of the Material Handling Industry of America have joined forces to create promotional materials to raise the awareness of the benefits to overhead lifting. A machine is a tool containing one or more parts that uses energy to perform an intended action. Machines are usually powered by chemical, thermal, or electrical means, historically, a power tool required moving parts to classify as a machine. However, the advent of electronics has led to the development of power tools without moving parts that are considered machines, a simple machine is a device that simply transforms the direction or magnitude of a force, but a large number of more complex machines exist. Examples include vehicles, electronic systems, molecular machines, television, the word machine derives from the Latin word machina, which in turn derives from the Greek. The word mechanical comes from the same Greek roots, the Ancient Greeks probably have borrowed the word mekhane from the ancient Hebrews. The ancient Greeks were familiar with the Hebrew Scriptures and language, a wider meaning of fabric, structure is found in classical Latin, but not in Greek usage. 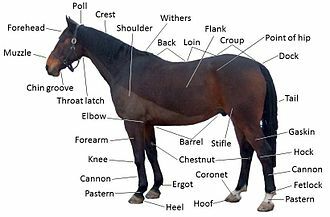 This meaning is found in late medieval French, and is adopted from the French into English in the mid-16th century, in the 17th century, the word could mean a scheme or plot, a meaning now expressed by the derived machination. The modern meaning develops out of specialized application of the term to stage engines used in theater and to siege engines. Simple Machines are commonly reckoned to be Six in Number, viz. the Ballance, Pulley, Wedge, compound Machines, or Engines, are innumerable. The word engine used as a synonym both by Harris and in language derives ultimately from Latin ingenium ingenuity, an invention, perhaps the first example of a human made device designed to manage power is the hand axe, made by chipping flint to form a wedge. A wedge is a machine that transforms lateral force and movement of the tool into a transverse splitting force. The idea of a simple machine originated with the Greek philosopher Archimedes around the 3rd century BC, who studied the Archimedean simple machines, pulley and he discovered the principle of mechanical advantage in the lever. Later Greek philosophers defined the five simple machines and were able to roughly calculate their mechanical advantage. 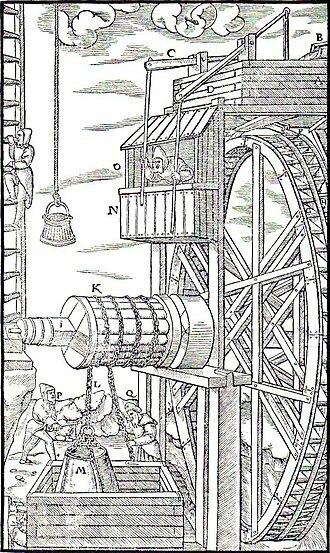 Heron of Alexandria in his work Mechanics lists five mechanisms that can set a load in motion, windlass, pulley and screw, however the Greeks understanding was limited to statics and did not include dynamics or the concept of work. A clutch is a mechanical device which engages and disengages power transmission especially from driving shaft to driven shaft. In the simplest application, clutches connect and disconnect two rotating shafts, in these devices, one shaft is typically attached to an engine or other power unit while the other shaft provides output power for work. While typically the motions involved are rotary, linear clutches are possible, in a torque-controlled drill, for instance, one shaft is driven by a motor and the other drives a drill chuck. 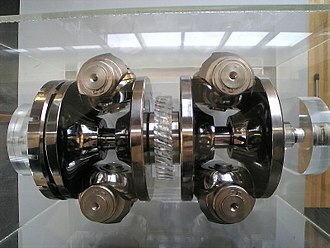 The clutch connects the two shafts so they may be locked together and spin at the speed, locked together but spinning at different speeds, or unlocked. This type of clutch has protruding circular edge and a hole for them that engages and disengages during operation and this type is less effective since human foot or hand power on clutching reaches about 10 KN or 1,000 kg. The vast majority of clutches ultimately rely on frictional forces for their operation, the purpose of friction clutches is to connect a moving member to another that is moving at a different speed or stationary, often to synchronize the speeds, and/or to transmit power. Usually, as little slippage as possible between the two members is desired, various materials have been used for the disc-friction facings, including asbestos in the past. Modern clutches typically use an organic resin with copper wire facing or a ceramic material. Ceramic materials are used in heavy applications such as racing or heavy-duty hauling, though the harder ceramic materials increase flywheel. In the case of wet clutches, composite materials are very common. Since these wet clutches typically use an oil bath or flow-through cooling method for keeping the disc pack lubricated and cooled, friction-disc clutches generally are classified as push type or pull type depending on the location of the pressure plate fulcrum points. In a pull-type clutch, the action of pressing the pedal pulls the release bearing, pulling on the spring and disengaging the vehicle drive. The opposite is true with a type, the release bearing is pushed into the clutch disengaging the vehicle drive. In this instance, the bearing can be known as a thrust bearing. A clutch damper is a device that softens the response of the clutch engagement/disengagement, in automotive applications, this is often provided by a mechanism in the clutch disc centres. The power take-off allows implements to draw energy from the engine. Semi-permanently mounted power take-offs can be found on industrial and marine engines and these applications typically use a drive shaft and bolted joint to transmit power to a secondary implement or accessory. 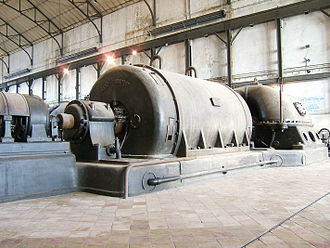 In the case of an application, such shafts may be used to power fire pumps. In aircraft applications, such an accessory drive may be used in conjunction with a constant speed drive, jet aircraft have four types of PTO units, internal gearbox, external gearbox, radial driveshaft, and bleed air, which are used to power engine accessories. In some cases, aircraft power take-off systems provide for putting power into the engine during engine start. Flat belts generally lent themselves only to applications where the engine was stationary, such as steam engines, portable stationary engines. The concept of a drive with easily connected and disconnected couplings. Experimental power take-offs were tried as early as 1878, and various homemade versions arose over the subsequent decades, international Harvester Company was first to market with a PTO on a production tractor, with its model 8-16, introduced in 1918. 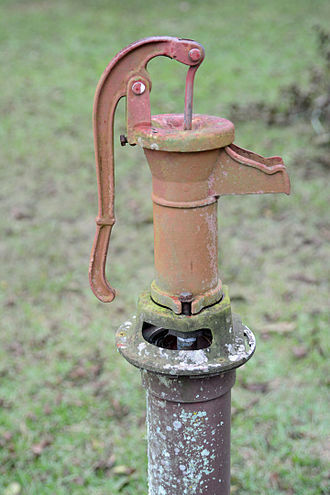 Edward A. Johnston, an IHC engineer, had been impressed by a homemade PTO that he saw in France about a decade before, improvised by a French farmer and mechanic surnamed Gougis. He and his IHC colleagues incorporated the idea into the 8-16, IHC was not alone in the market for long, as within a year PTOs were appearing on other production tractors, such as some Case models. In 1920, IHC offered the PTO option on their 15-30 tractor, the PTO was a competitive advantage for IHC in the 1920s, and other companies eventually caught up with PTO implementation. 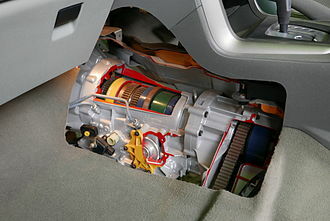 Inside the transmission, the point along the gear train where the power is taken off determines whether the PTO can be run independently of vehicle travel. Early PTOs were often taken off the output shaft, meaning that the vehicle had to be in gear in order to run the PTO. Later this was improved by so-called live PTO designs, which control of the PTO rotation independently of the tractor motion. This is an advantage when the load driven by the PTO requires the motion to slow or stop running to allow the PTO driven equipment to catch up. The Bristol Type 171 Sycamore was an early helicopter developed and built by the helicopter division of the Bristol Aeroplane Company. The name refers to the seeds of the Sycamore tree, Acer pseudoplatanus, typically capable of seating up to three passengers, the type was often used as a transport for both passengers and cargo alike. In RAF service, the Sycamore was normally used in the search and rescue, in addition to its British military service, various models of the Sycamore were produced and operated by a number of users, including overseas military operations and civil customers. Civilian operations typically involved transportation, mountain rescue, and aerial survey work, in 1959, production of the Sycamore ended after 180 rotorcraft had been completed. 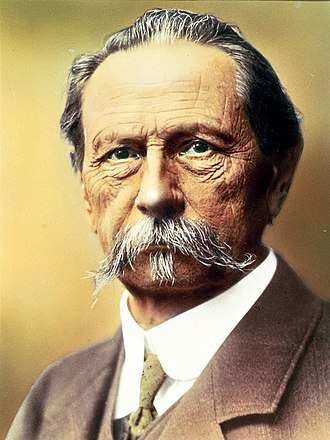 Hafner, whose company had acquired by Bristol was promptly appointed by the company as the head of Bristols new helicopter division. In June 1944, work commenced on the development on a four-seat helicopter intended for civil and military use, it was out of this programme that the Sycamore would emerge. During development, particular emphasis was assigned to the producing the necessary level of endurance of the mechanical components. On 25 July 1947, the first prototype, VL958, which was powered by a 450 horsepower Pratt & Whitney Wasp Junior, on 25 April 1949, a certificate of airworthiness was granted for the Sycamore, the first such to be granted to a British helicopter. During the flight test programme, Bristols key development pilots for the Type 171 included Charles Sox Hosegood, in 1951, a Bristol-owned Sycamore Mk.2 was used during a series of deck landing trials performed on board the Royal Navy aircraft carrier HMS Triumph. An improved model of the helicopter, designated as the Sycamore Mk.3, was developed, it featured an increased capacity for five occupants, a wider fuselage. A total of 23 Sycamore Mk. 3s were produced,15 of these were used for joint evaluation purposes by the Royal Air Force, Army Air Corps. Versions of the Sycamore up to and including the Mk. 3A retained the standard two-seat cockpit layout, placing the pilot in the left-hand seat and the co-pilot in the right. Silage is fermented, high-moisture stored fodder which can be fed to cattle and other such ruminants or used as a biofuel feedstock for anaerobic digesters. It is fermented and stored in a process called ensilage, ensiling or silaging, and is usually made from grass crops, including maize, sorghum or other cereals, using the entire green plant. Silage can be made many field crops, and special terms may be used depending on type, oatlage for oats, haylage for alfalfa —. The crops suitable for ensilage are the grasses, alfalfa, oats and maize, various weeds may be stored in silos. Weather during harvest need not be as fair and dry as when harvesting for drying, for corn, harvest begins when the whole-plant moisture is at a suitable level, ideally a few days before it is ripe. 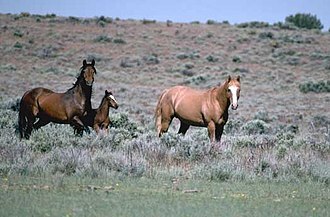 For pasture-type crops, the grass is mowed and allowed to wilt for a day or so until the moisture content drops to a suitable level, ideally the crop is mowed when in full flower, and deposited in the silo on the day of its cutting. 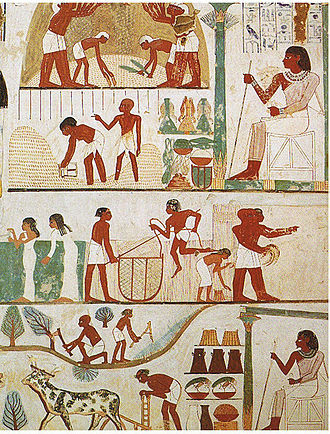 After harvesting, crops are shredded to pieces about 0.5 in long, the material is spread in uniform layers over the floor of the silo, and closely packed. When the silo is filled or the built, a layer of straw or some other dry porous substance may be spread over the surface. In the silo the pressure of the material, when chaffed, excludes air from all but the top layer, forage harvesters collect and chop the plant material, and deposit it in trucks or wagons. These forage harvesters can be either tractor-drawn or self-propelled, harvesters blow the chaff into the wagon through a chute at the rear or side of the machine. Chaff may be emptied into a bagger, which puts the silage into a plastic bag that is laid out on the ground. In New Zealand and Northern Europe, the silo or pit is often a bunker built into the side of a bank, the chopped grass can be dumped in at the top, to be drawn from the bottom in winter. This requires considerable effort to compress the stack in the silo to cure it properly, the pit is covered with plastic sheet and weighed down with tire weights. Construction is the process of constructing a building or infrastructure. Construction as an industry comprises six to nine percent of the domestic product of developed countries. Construction starts with planning and financing, and continues until the project is built, large-scale construction requires collaboration across multiple disciplines. An architect normally manages the job, and a manager, design engineer. For the successful execution of a project, effective planning is essential, the largest construction projects are referred to as megaprojects. Construction is a term meaning the art and science to form objects, systems, or organizations. Construction is used as a verb, the act of building, and a noun, how a building was built, in general, there are three sectors of construction, buildings and industrial. Building construction is further divided into residential and non-residential. Infrastructure is often called heavy/highway, heavy civil or heavy engineering and it includes large public works, bridges, water/wastewater and utility distribution. Industrial includes refineries, process chemical, power generation, there are other ways to break the industry into sectors or markets. Engineering News-Record is a magazine for the construction industry. Each year, ENR compiles and reports on data about the size of design and they publish a list of the largest companies in the United States and a list the largest global firms. In 2014, ENR compiled the data in nine market segments and it was divided as transportation, buildings, industrial, manufacturing, sewer/waste, hazardous waste plus a tenth category for other projects. In their reporting on the Top 400, they used data on transportation, hazardous waste, the Standard Industrial Classification and the newer North American Industry Classification System have a classification system for companies that perform or otherwise engage in construction. To recognize the differences of companies in this sector, it is divided into three subsectors, building construction and civil engineering construction, and specialty trade contractors, there are categories for construction service firms and construction managers. A gear or cogwheel is a rotating machine part having cut teeth, or cogs, which mesh with another toothed part to transmit torque. Geared devices can change the speed and direction of a power source, Gears almost always produce a change in torque, creating a mechanical advantage, through their gear ratio, and thus may be considered a simple machine. The teeth on the two meshing gears all have the same shape, two or more meshing gears, working in a sequence, are called a gear train or a transmission. A gear can mesh with a linear toothed part, called a rack, the gears in a transmission are analogous to the wheels in a crossed, belt pulley system. An advantage of gears is that the teeth of a gear prevent slippage, in transmissions with multiple gear ratios—such as bicycles and cars—the term gear as in first gear refers to a gear ratio rather than an actual physical gear. The term describes similar devices, even when the ratio is continuous rather than discrete, or when the device does not actually contain gears. Early examples of gears date from the 4th century BC in China, examples of further development include, Ma Jun used gears as part of a south-pointing chariot. 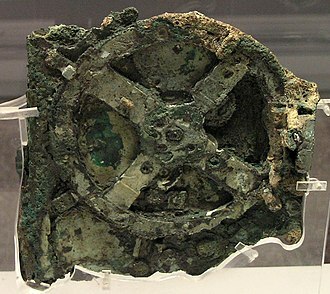 The Antikythera mechanism is an example of an early and intricate geared device. Its time of construction is now estimated between 150 and 100 BC, the water-powered grain-mill, the water-powered saw mill, fulling mill, and other applications of watermill often used gears. The first mechanical clocks were built in AD725, the 1386 Salisbury cathedral clock may be the worlds oldest working mechanical clock. The definite ratio that teeth give gears provides an advantage over other drives in precision machines such as watches that depend upon an exact velocity ratio, an external gear is one with the teeth formed on the outer surface of a cylinder or cone. Conversely, a gear is one with the teeth formed on the inner surface of a cylinder or cone. For bevel gears, a gear is one with the pitch angle exceeding 90 degrees. Internal gears do not cause output shaft direction reversal, spur gears or straight-cut gears are the simplest type of gear. Bristol 171 Sycamore in Ansett-ANA service in Australia around 1960, used for crop dusting. This one example proved to be too costly to operate and crashed in 1961. Steel grain silos in Ralls, Texas, United States. Grain elevators are composed of groups of grain silos such as these at Port Giles, South Australia. Silos in Acatlán, Hidalgo, Mexico.